Our projection screens have a free-standing tripod and collapse for easy transportation. SKU: VBA02. Category: Audio/Visual. Tags: movie screen, projection screen. Great for painting murals or presentations, this projector collapses down to the size of a briefcase for easy transportation but will only project transparent images. This item requires a standard 110v power supply. Our slide projectors are 35mm Kodak Carousels and include one carousel, a wired remote, and an extra bulb. 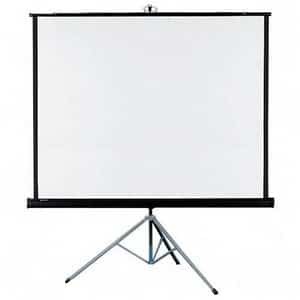 We also carry various sizes of projection screens which are rented separately. This item requires a standard 110v power supply. This LCD projector is a high powered projector great for movie nights, slide shows where you don’t want the lights turned off, larger business meetings, and much more. This LCD projector offers 4400 lumens of brightness, full 1080p high definition resolution, a 16 watt internal speaker great for groups up to about 50 people (additional sound options needed for larger groups), and multiple hookup styles including: USB, Computer, HDMI, RCA, and LAN. This karaoke machine is has crisp sound even at higher volumes, puts out a total of 250 watts, is on casters for easy mobility, can be hooked up to any ipod or mp3 player, is great for larger parties, outdoor parties, as a sound system for a wedding, can be used as a p/a, and comes with two microphones, all the hook-ups needed for connecting to a tv (tv not included), and your choice of 5 full cd’s (or 10 half cd’s). Additional karaoke cd’s are available if wanted but rented separately. This item requires a standard 110v power supply.